One of the things that is normally said about Giotto, is that he threw out the Byzantine tradition, in order to invigorate art with more realism and thus kicked off the “Renaissance” in art. This narrative begins in Georgio Versari’s Vite Degli Artisti, where he makes this claim. In my view this is a gross oversimplification. Versari often made judgments about periods hundreds of years before his time which seemed suitable and fitting, epic figures that bring a rapid and incredible change to events, as if nothing came before them. He does the same when he claims Jan Van Eyck invented oil painting, even though it was known in Versari’s time that oil painting was as old as the 12th century. It was Van Eyck, however, who perfected it. In like manner, Giotto did not invent some of the styles which Versari claimed to pioneer, and a close analysis shows he did not in fact throw out Byzantine tradition in painting, rather, he re-worked it. 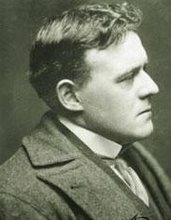 He was also not the first to do so, his predecessors, Cimabue (Giotto’s teacher) and Duccio had pioneered the same techniques, Giotto made them better. They still maintain the sense of perspective of Byzantine art, yet their work relies on realism to convey the message, rather than symbols as in Byzantine art, and blue backgrounds replace gold to heighten that sense of realism. 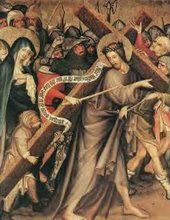 “After the Easter solemnities, he [Francis] placed a superior in the convent; then having tenderly embraced the religious, he made the sign of the cross on them, and separated himself from them to go to Arezzo. This town was at that time greatly agitated by intestine dissensions, which were likely to bring on its entire ruin. Francis being lodged in the suburbs, where he had been hospitably received, saw over the town, with the penetrating sight which the Almighty had given him, devils who excited the citizens to massacre each other, and who appeared to be transported with joy. To put these evil spirits to flight, he sent Sylvester, as his herald, and gave him this command: “Go to the gate of the town, and standing before it, order the devils, in the name of the Almighty God, and in virtue of obedience, instantly to retire.” Sylvester, who was a man of extraordinary simplicity, praising God beforehand for what was about to happen, went as fast as possible, and cried out with all his might “All you devils who are here, begone, go far from hence. It is in the name of God and of His servant, Francis, that I call upon you to go.” At this very moment the citizens, who were on the point of flying to arms, came to an understanding on the points which were in dispute, and peace was restored to the town. On which St. Bonaventura remarks, that the obedience and humility of Francis had obtained for him that absolute power over the proud spirits who fear and fly from the sublime virtue of the humble. Now the fresco is part of a series on the life of St. Francis which adorns the upper basilica of St. Francis in Assisi, a truly amazing Church. 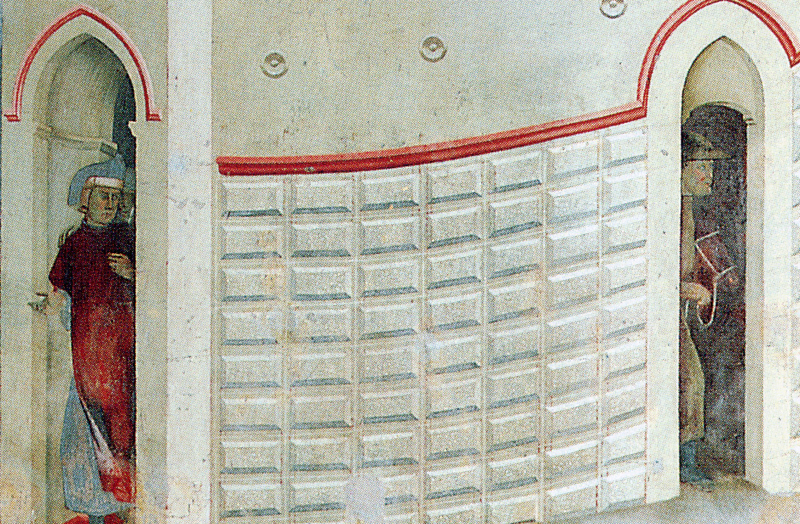 Many of the Frescoes are ascribed to Giotto, however there is a debate amongst art historians as to whether Giotto was in fact the one who painted them. It would have been early in his career as a disciple of Cimabue. To top things off, Napoleonic troops mistreating the basilica in the early 1800s destroyed the documents relating to the commissions, resulting in the fact that we will not really ever know. I’m inclined to follow the tradition in ascribing them to Giotto, because the employ a number of emotional and theological distinctions found in much of Giotto’s other works. 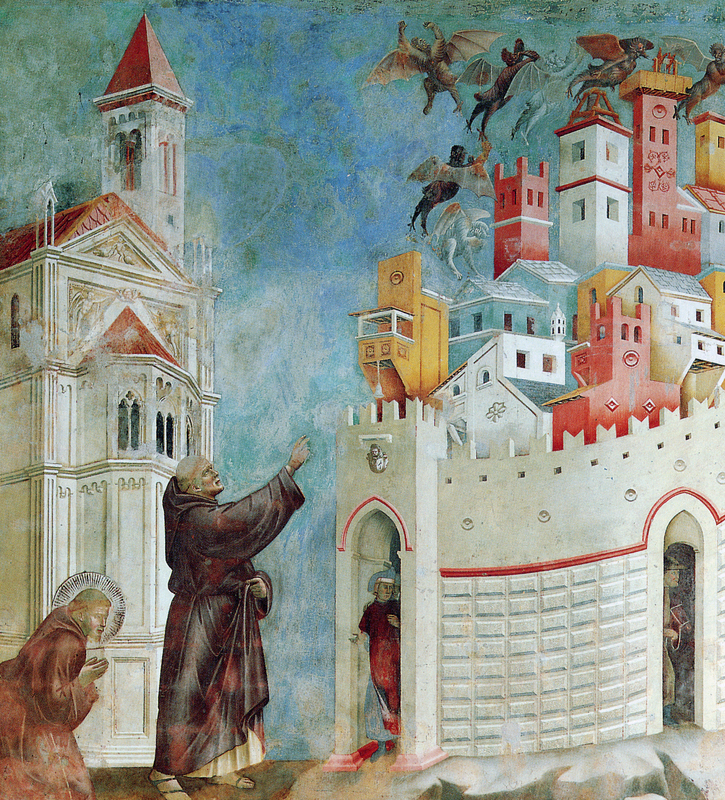 The painting depicts the town of Arezzo, from this story. 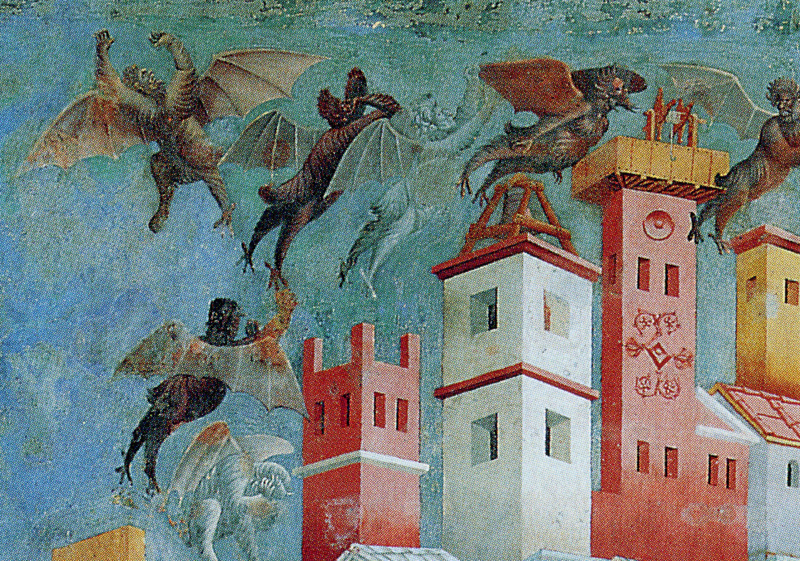 The demons are seen fleeing at the command of Fr. Sylvestro. Immediately behind the priest is St. Francis. This is an impressive theological tool, for as we saw above St. Francis was not present for the event. Why didn’t he do it himself? The answer is that Francis was not in orders, and even if he had already been ordained to the diaconate, the Church restricts exorcism to the priest. Therefore it was necessary for Francis to make use of Fr. Sylvestro. Yet it was not merely Fr. Sylvestro who cast out the demons. As we see from Chalippe’s narrative, St. Francis applied his prayers to strengthen Fr. Sylvestro when confronting the demons, so that through prayer, Francis has added to the Church’s spiritual treasury, whence the strength is provided for Fr. 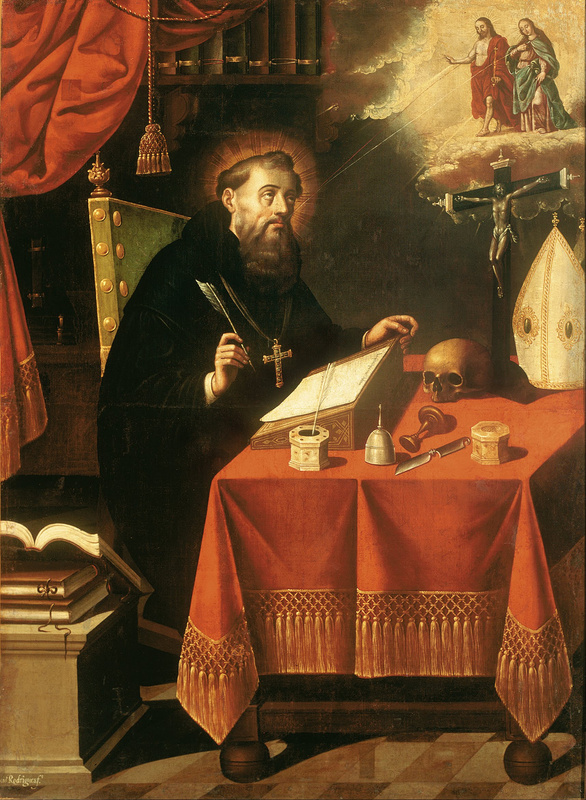 Sylvestro through his office as a priest. Moreover, there is an interesting element employed just to the right of St. Francis and Fr. Sylvestro, though we tend to overlook it due to the focus of the more dramatic elements, namely the expulsion of the demons. This is the gates of the city. Here, we see two gates, a wide one and a narrow gate. From the wide gate the city’s bourgeois depart, yet through the narrow gate at the right a farmer and his donkey. This is a curious image, and it has a line of symmetry with the demons departing above. The narrow vs. the wide gate recall the Gospel of St. Luke, where our Blessed Lord declares that we should enter by the narrow gate, for the wide gate leads to perdition. There is a wider social commentary on the times, which predate Guelphs and Ghibellines, but focuses on the question of rich and poor, virtue and sin. Painters in Giotto’s day were considered craftsmen, and below a noble status, contrary to how artists would be viewed in the time of Michaelangelo, Raphael and Versari, or before we hit the contrasts of the noble and refined as in a Rubens or a Correggio, and the dysfunctional geniuses and social activists of a Caravaggio or a Rembrandt. Therefore painters are often looked down upon as men who work with their hands. In this Fresco, Giotto returns the compliment. The farmer leads his donkey out on the right, while the merchant goes out on the left. In a culture where such symbols mattered, the message was eminently clear, those who work with their hands will be saved by diligent work and prayer, those who are exceedingly wealthy, bankers, usurers, etc., are idle, and, well they are not going to be saved. Now, the central focus of the painting falls upon the demons. As we saw in the narrative, they have been cast out of the city. They were attempting to foment the town into tearing itself apart in a civil war. Now the town below is restored to peace, and the demons are given the boot. Their depiction often resembles the manner of depicting demons in byzantine art, where the demons are black, showing the contrasts between night and day, darkness and light. But here a few different touches are added. Some of them are transparent, one is reddish, and these all carry out a certain level of distinction. For Giotto here, is representing different sins, reddish for violence, transparency for gossip and the intangible crimes people commit, another lust, and another less transparent demon envy. All leave at the command of the priest, showing the demons must obey divine order. If we then follow the line of symmetry downward, then we find the town at peace, liberated from demonic oppression. Lastly, reconnecting the scene at the gates with the demons, people are now free to pursue their course. It is a fundamental insight of Giotto, sin comes from the World, the Flesh, and the Devil, and all three are embodied here. With the devil expelled, now there is the world and the flesh, symbolized by the rich man, who wears the same colors as the city’s town hall. The farmer, however, isn’t so much the poor man, as the man who works with his hands, who is not idle. In this way, St. Francis, il poverello, is behind Fr. 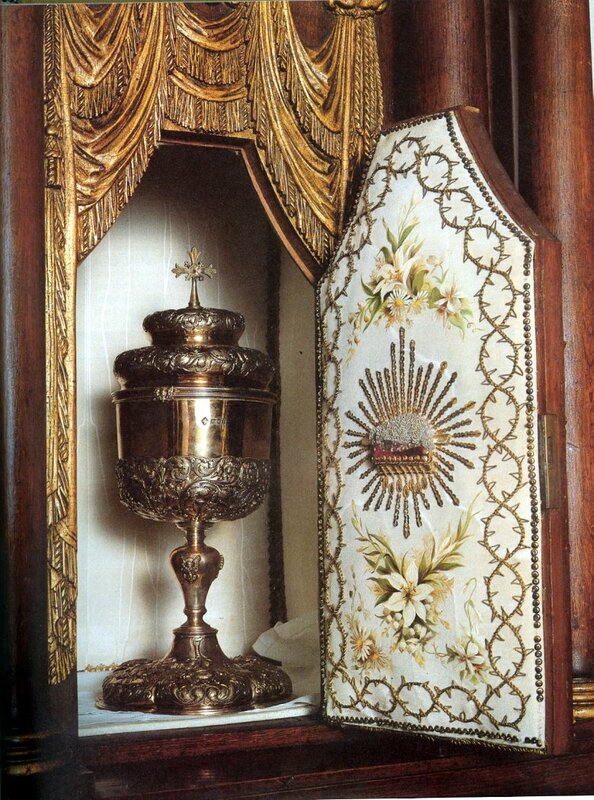 Sylvestro, not just backing up his priestly action, but almost ordering it all, as though he was giving his blessing to the farmer going out the narrow gate. It also recalls a story of a farmer who joined the Franciscans, and he was from a very poor family, so he sold his donkey. St. Francis heard how destitute the family was and worked to get back the donkey to the parents, but dined with them to console them of the benefits they would receive for having their son enrolled as a friar minor. Work brings virtue and reward, idleness, departing out on the left, that is damnation. In fact, this is seen in that one of the demons looks precisely upon the rich man leaving the wide gate, as if to say we still have hold of this one. On the other hand, a demon that is mourning is glancing at the man leaving the narrow gate, and weeping. For the demons, what idleness gains, hard labor loses. 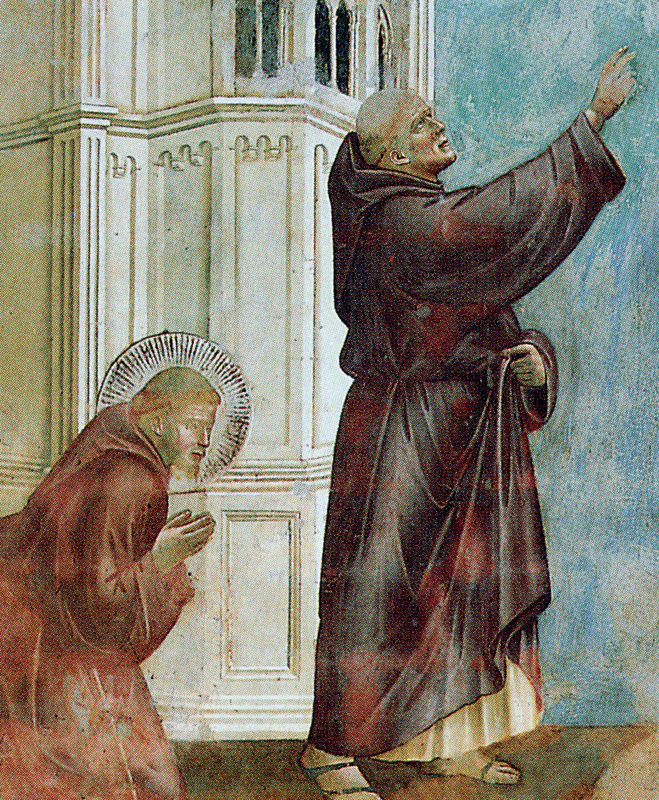 Thus, I believe Giotto is doing more than a rich and poor narrative, rather it is more a question of virtue, work as opposed to the idleness of riches, and St. Francis, who combines poverty utterly to work and labor, against the flesh, against the world, and here, through the priesthood (recalling St. Francis’ great devotion to the holy Eucharist), against the devil. Therefore enter through the narrow gate.